A whole world of colour faded into vision as her eyes adapted to the light. Greys and shadows, beauty. Greens farther before her. She stood, her legs quivering. She stumbled, falling on her bum. A haze clouded her mind, like she had just woken from a long nap. She remembered nothing but a string of two words. It rang a bell, and immediately, the hatchling knew it was her name. Solstice stood once more and walked forth, managing to remain stable despite her limbs being asleep. It was clear she knew how to walk, though she felt very out of practice. Reaching the entrance of the cave, half asleep. And then one cautious step forward into the grass. "Hello?" yelped the child. Her legs were shaking. SHE was shaking. Before her stood long green grasses. A steep hill led gracelessly down into a valley. Rock ran along the sides, falling into the crevice. To the left of the valley was a clear pond, obviously alive with fish of some kind. Massive green trees formed a canopy over the horizon, tiny black silohuettes rising and falling from the tree tops. She shook herself, trying to wake up. "Anyone?" She called once more. Solstice prayed someone heard her. You figure for such a massive place, there would be another living creature willing to help. While her calling could attract danger, she took the risk. Someone had to explain these strange happenings to her, or at least where she was. Who she was. And smoke curling around his two crimson nostrils. He flew. Oh he flew. At his top speed. Which was sixty miles. He was so fast. He loved being fast! HE LOVED BEING FAST! Opening his jaws, a roar escaped Aviur's maw as he back flipped, then dived towards the valley, his wings clasped to his sides as he became a red blur, diving faster then an eagle. Only dragons could do this. Only dragons could do this and live to tell the tale. As he approached the ground, Aviur noticed a pond, and a.. Cave? He could see the shadows of a mouth of a cave on a hill. But he was above it, so he'd have to look at it from the side. Diving into the valley, Aviur came dangerously close to the ground, and then.. He snapped open his wings, extending them to their fullest as he was yanked out of his dive and upwards into a flight path parallel with the ground. And of course, it was a winding valley, and he was going at fifty miles now into it's path, with a huge tree directly in the center. Pulling himself upwards, Aviur went into a vertical flight path, his scales nearly scraping against the tree. When he was over the top of it, he slowed down and stalled, twisting in the air so his stomach was to the tree. Pulling out of the dive, he turned and went up, diagonally flying over the hill wher ehe saw the cave and touching down on it's surface. Panting, Aviur turned slightly, looking over his shoulder to look at the valley and the huge tree that had nearly killed him. Or, if he was lucky, just cause major brain damage and make him become a vegetable. Jumping around to face the tree, Aviur raised his wings and roared in victory, before he started leaping around. "WHOOOOHOOOO! TAKE THAT MOTHER NATURE! I'M COMING, GOING, CAN'T BE STOPPED! WOOO!" Not realising he had backed up so he was directly at the mouth of the cave, Aviur didn't notice the ice dragoness behind him. Solstice continued to stumble around in the grass, when she heard a scream echo across the sky. Her eyes widened, now terrified. Where had she awoken? She brushed it off and began to walk down the steep hill into the valley. The grass tickled her legs, and some of it even reached her face. Spitting a strand out, she suddenly noticed the silhouette in the distance was dropping to the ground at an alarming rate. An even more frightening factor in this situation was that the figure appeared to be on fire. Solstice wasn't sure how usual that was, but something about it triggered a bit of anxiety deep within her. Her eyes widened. The figure was flying straight towards her. She let out a tiny squeak and ran back up the hill as quickly as her little legs could carry her. A flaming, possibly murderous dragon was flying at her! The dragon yelled again, landing right infront of her. It appeared that he didn't notice the child yet. She was afraid to speak up. She swallowed and crept closer to the dragon, trying to remain as silent as possible with the long, bristling grass moving with each step. All that had to be done now was to speak up. She inhaled quietly, and stopped herself. She couldn't bring herself to speak to him. At this rate, the world seemed to be moving at the rate of molasses. She felt panicked. "Hello?" the dragoness said in a shaky voice. Just woken up with absolutely no memory, and already faced with someone who could stop her in her quest of finding where she was. "My queen, is this walk really a good idea? We're so far from the IceWing border. I don't understand why you wanted to come here," a large, intimidating, male IceWing would say. He was nearly sixty feet tall, and had green stripes on his legs, with the rest of his body being white and grey, with some blue on his underbelly. He had two large, curved horns, like that of a ram, on his head, and he was had plated scales. Not to mention he was covered in a full set of armor. Next to the dragon was another one like him, though this one was female. She was slender, and about forty feet tall, with feathery wings that were slightly grey, while the rest of her body was white. Her face was greyish, and her horns were almost black. She had a stoic expression, but she still kept a careful eye on the dragon in front of them, the one that the green and white dragon was addressing. 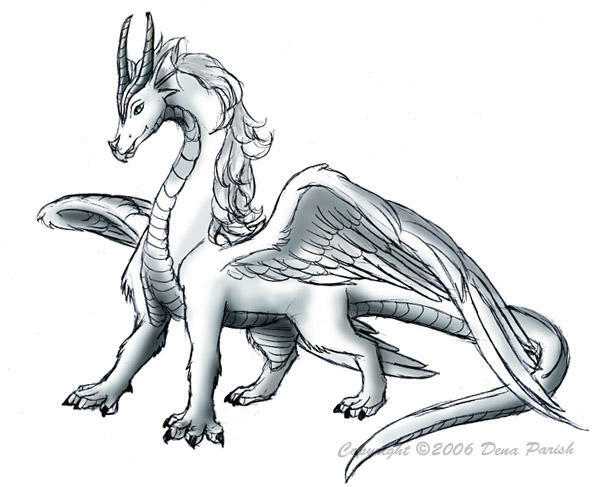 This small dragoness, the queen, was much smaller than any normal IceWing. She also had very wolf like features. She had tannish wings, and a fluffy white coat. She also had some feathery wings. She appeared quite happy, humming to herself, even while the large, green and white dragon spoke to her. She replied back and a nonchalant voice. "Relax, Arethmic. You guys didn't have to come along. I even told you this," Virgo said with a roll of her eyes at her guards. It was a miracle she had been able to get away with only two. She remembered that when she had tried to take a walk by herself right after the ceremony, Avalanche had sent nearly twelve guards after her. Now that had just been overkill. Virgo was more than capable of getting away by herself. She was much faster that both her guards, anyway. This didn't seem to help Arethmic, though. In fact, it only made him more agitated. "My queen, I wouldn't argue with you if you went on a walk by yourself in the IceWing territory, near the castle, but be reasonable. There was no reason for you to come all the way out here. Especially without guards. The female, who's name was Fantasia, glanced at Arethmic. It was a strange, sideways glance. Virgo could never tell what Fantasia was thinking. She always seemed either lost in thought or super serious. It wasn't like either guard was inexperienced. Both guards were over thirty. Virgo knew Arethmic was like, 32, and Fantasia.... was roughly 37, but she wasn't quite sure. She never had been able to get Fantasia's age out of her, since she rarely spoke. While Virgo and Arethmic argued, Fantasia glanced up. And there she saw it. A fireball, speeding straight towards the grassy hills, near a large cave. She froze, and grabbed Virgo by the scruff of her neck. Virgo let out a yelp of agitation, but froze when she saw the fireball. They remained here, silent for a moment, until the fireball revealed itself to be a dragon, and it started yelling. Arethmic was furious. "That arrogant beast! It could have killed someone!" and he started going on a rant about that. But Virgo was curious. She glanced up, still being held in Fantasia's mouth, before looking up at the dragoness, asking curiously. "Hey, Fantasia, you think we could go check that out?" Virgo asked. Arethmic instantly was snapped back into reality, and growled. "Absolutely not! We will not converse with savages, my queen! We have strict orders from the Head Royal Adviser to keep you safe. There is no way will risk your life because of a bit of cu-"
"Yes, my Queen." Fantasia suddenly said, setting Virgo down. Her voice was calm, and almost monotonous. But it caused Arethmic's mouth to drop nonetheless. Virgo ignored him, and rushed up the hill, slowing down as she reached the fiery chaos, leaving her two guards to argue, barely noticing her rush of. "Hey there! That was really wicked! I wish I could fly like that!" Virgo chuckled, approaching the dragon, looking up at him with wide eyes. She had never seen anything like that before! It was just... awesome! Virgo had not yet noticed the little hatchling behind the fire dragon. Aviur was busy yelling at the top of his lungs, when he heard a quiet, "hello?" coming from behind him. It was so soft for a moment he thought he'd imagined it. As he was turning his head, he noticed a few dragons below the hill. He listened in on their conversation, and heard the large, brutish looking male dragon call him a 'savage.' Savage? he'd never been called that before. He laughed as the female set down the dragoness who looked to be around his age and the male's jaw fell open. Queen? His head perked up as he quickly closed his sail, realising these were IceWings. He couldn't risk his life source being put out. The open flame was hidden from view as the two red halves of his little sail leapt out of their sockets and clasped together with a little 'click.' Sheathing his claws, he got rid of those flames as well, so now he looked pretty normal. The female rushed up the hill to him, and Aviur turned to face her, eyes slightly widened in surprised. No one had approached him like that before. When she spoke, he found his voice and smiled. "Thanks! Hey, I could teach you some time! My name's Aviur, at your service," he chuckled, doing a mock little playful bow. "Also known as the 'wrecking ball' of the firewing tribe." his bright yellow, eerie looking eyes glanced over her shoulder to see the two dragons arguing. He raised a brow. "I've never been called a savage before. I've been called msny names, but not that. The guy's creative with names," he looked back at her and grinned, showing he wasn't offended and actually found it amusing. He was used to being called names. It was a part of his daily life. Moron, idiot, little stink, rascal, reckless dragon, that sort of thing. Savage was now a part of that list. Awesome! He admitted, she was quite pretty. And unusual. He'd never seen a dragon like her before. She almost looked.. Wolfish. As he awaited a response from her, he remembered the little voice. Quickly, he glanced with his eyes to his right, into the cave, and saw it. A little dragon. Not much younger then him, standing there. His eyes went back to the wolfy dragon's eyes and he locked gazes with her. What should I do? He thought. He had literally only glanced for a split second, so he hoped she didn't notice or get suspicious. He prayed the hatchling would stay hidden until he knew she wouldn't be attacked. Wait.. Why am I protecting someone when I haven't even met them? he thought, blinking as he smiled at the female. This is ridiculous. I've got a female on my right whose clearly clueless and scared, and I've got a female in front of me with two dragons, one of them brutish and probably ready to murder my face. What should I do? Solstice muttered to herself, suddenly seeing three dragons. A lithe dragoness, a muscley brute, and a short dragon.. thing. The brute appeared to be panicked. The tan creature seemed to be of importance. It looked as if she was not meant to go over to the flaming dragon, though she did to the protest of her guards. It appeared as if neither of them noticed the hatchling. She thought of speaking up and getting their attention, though she hesitated. Things could possibly go negatively. While the important dragoness seemed to be childish, the fire dragon was visibly nervous. Solstice took a step forward, freezing in place as the flaming dragon looked at her. His eyes darted from her to the tan dragoness. He knew she was there. The hatchling took another careful stop forward. She was sure to make sure that he knew she wasn't going to harm him. Besides, how could she, A four foot tall hatchling, cause physical injury to an adult? Solstice continued to walk forward, and came to a stop. She kept her distance from the dragons. "What's going on?" called the hatchling. She spoke up this time, as she was not noticed by the adults previously. She felt a sudden wave of panic, as if she were going to die, right here. However, with the silliness of the dragoness and the anxious attitude of the large, no-longer flaming fire dragon, she doubted it. "Wow, really? That would be so cool! I've never really been all that good at flying. I prefer to run. It'd be awesome if I knew how to do stuff like that, though," commented Virgo, staring up into the dragon's eyes, her wolf ear flicking a bit. A chilly breeze would drift through the air. It didn't really affect Virgo, being an IceWing, but it did make her fur and feathers bristle a bit. Or maybe that was just the heat that the stranger was creating. Or, well, Aviur, as he had just told her his name. She smiled, both ears perked, as she responded, "Aviur? That's a cool name. My name's Virgo! It's nice to meet you. Aaand that's a nice title," she'd add with a small smirk. He must be the rebellious kind to earn a title like that. "I bet you get all the girls with a title like that," she added once more, though this time in a joking manner, flicking her tail some as another sharp breeze would drift in between them. When he commented about overhearing the name that Arethmic had given him, she rolled her eyes, becoming more agitated. Though, she was agitated with Arethmic, not Aviur. "Pfft, just ignore him. I'm sure he thinks most FireWings are savage. I think you're pretty cool, and that's all that matters," she said, becoming happier with her last few words, her eyes and spirit lifting as she said them. Just as Virgo was about to say something else, she heard a small voice call out. It was coming from behind Aviur. Curious, she walked around him, gasping when she saw the tiny hatchling, only about four feet tall, behind the massive dragon. It was obvious Aviur had been trying to hide it from her. And the hatchling also appeared to be an IceWing. "Awww... what's a cute little IceWing like you doing all the way out here?" She then turned back to Aviur, skeptical. "This isn't like, your sister, or something is it?" she asked cautiously, unsure of what was going on. Meanwhile, Arethmic and Fantasia had realized Virgo had ran off. Well, Arethmic had, Fantasia had already know. Of course, Arethmic panicked, and raced up the hill towards her. Fantasia followed, her pace much slower than his, a calm trot, following him up the hill. She kept a stoic expression as she did so, watching him with a careful calculation. When Arethmic reached where the fire dragon was, he snarled. "My queen, I told you to stay away from him!" Arethmic growled, putting himself in between Aviur and Virgo. This made Virgo growl. The sudden outburst of noise would surely frighten the hatchling. "You imbecile! He isn't going to attack me! Stop being an overprotective dad," she said with a sigh, moving around Arethmic, despite his protests. Aviur was taken aback by how nice this female was. He gazed back down into her sea blue eyes. His yellow eyes were eerie, while hers were enchanting. Funny how different they were. He was Fire, she was Ice. He was mean, she was nice. Then again, opposites attract, right? Without meaning to, Aviur smiled. "Virgo? Where have I heard that name before?" he asked, mostly to himself. He'd heard the name before somewhere.. And then she smirked, which made him raise a brow, then she spoke words that made him splutter and glance away. "Truth is, I've earned more slaps then winks," he chuckled, joking about it. He winked playfully at her, before looking at her properly again as she responded to his comment about the male dragon with a roll of the eyes. He opened his mouth to say something smart about him, when she said 'I think you're cool thou, and that's all that matters.' His yellow eyes widened as his words became lodged in his throat. Hiccuping, he gaped, before stammering. "C-cheers, Virgo. Y-you're cool too." trying to save himself, he smirked at her and added two words. "Pun intended." Then she noticed the hatchling behind him. Aviur gulped, then relaxed when she fangirled over the hatchling. He was surprised and, admittedly, a little jealous of the description she gave the hatchling. Okay, he had to stop being so full of himself. Spluttering at Virgo's question, he shook his head. "What? No! I don't know her. Just noticed her a few seconds ago, actually," he responded. He opened his mouth to ask the hatchling her name, when he heard pawsteps dashing up the hill. Snapping his head around, Aviur growled menacingly as the male pushed himself in between him and Virgo. "Chill, old man, I wasn't doing anything," he growled, deciding to have a dig at him for startling him. What? He'd called him a savage! He made eye contact with the male and stood tall, glowering rebelliously and aggresively at him. It was clear he wasn't planning on backing down or showing any submission. Solstice watched the two talk, and it seemed that only the fire dragon noticed her. As they introduced themselves, she finally caught their names. Aviur and Virgo. They appeared to be very deep in conversation, Virgo's guards still panicked about Aviur. She was rather worried now, in the off-chance that they decided to take her in. Or worse. The hatchling took a step back as Virgo neared. She mentioned something about being an IceWing. Once again, it rang a bell. She wasn't quite sure how, but it seemed familiar. "What's an Icewing?" Solstice asked, very concerned about the sanity of both herself and Virgo. "Where are we?" By now, Solstice realized she had finally got the answers she had been hoping for. All of her wishes answered, and she had only just woken up. It was incredibly irritating that those names seemed to make so much sense to her. She didn't quite get how, though, as all she could do right now was breathe, speak and know her name. Those two didn't exactly seem like adults either, and she wasn't quite sure that she could trust their information. However, she went against her judgement and took her words as fact anyhow. Virgo chuckled. Ah, puns. The cringiest of jokes. She smiled back, her bright blue, wolf like eyes staring up at Aviur. When he said the hatchling wasn't his, she frowned. Who's could it be, then? Suddenly, Arethmic stepped in front of them, and before she knew it, the queen was much farther away from the fiery dragon, and the hatchling. Arethmic was easily angered, so she really hoped Aviur backed down. It was clear Aviur wasn't going to step down, though. His bright eyes alight with the flame of rebellion, he would hold his ground, even as the dragon that was nearly twice his size would tower over him, giving him a death glare, as if the dragon had done the worst offense imaginable. The two were like stone statues, not moving, and the weight of the wind barely effected them. In fact, it probably just chilled their bones and fueled their fire. But then Aviur did something he really shouldn't have. He spoke up, no doubt enraging the large, intimidating white and green dragon even more. You could just see his eyes widen, and his snarl increase. Not only that, but Aviur had practically insulted him by calling him old man. The great, icy dragon would raise his massive body, standing over Aviur. A smoke would begin to billow up around the armored dragon. Clearly the fumes of his rage. This caused Virgo to shiver. She couldn't have the two of them fighting. Arethmic would snarl at the dragon, now ignoring Virgo's plea from before. "I don't know who you think you are, but I will not be spoken to in such a.... disrespectful manner! I saw how you treated the queen! You need to learn some respect, commoner!" he roared. White smoke would bustle from his mouth. This was bad. What if the hatchling was hurt in the process. She attempted to race over to deflect the blow, but Fantasia was already there. She quickly jumped in the way of the attack, parried the blow, and knocked Arethmic flat onto his face, all within a manner of seconds. Virgo had never seen Fantasia's skills in combat before. But if they were anything like this, chances were she wasn't once of her best guards for nothing. Who needs a hot head like Arethmic when you have a ninja like Fantasia! A smile crossed Virgo's lips. "Thanks, Fantasia!" she purred. The dragoness nodded solemnly. Then Virgo turned her attention back to Aviur, "Oh, uh, yeah, I suppose I should introduce you to these two. The one that just took down the 20 ton dragon is Fantasia. The one on the ground is Arethmic." Virgo would say with a sigh, glancing over at her guards with a slight frown. She then turned back to Aviur. She glanced around at the little hatchling. That was when Fantasia spotted the hatchling, too. For the first time since Virgo had met her, the royal guard's eyes widened, as if she'd seen a ghost. Virgo frowned, glancing back at her royal guard. "Something wrong, Fantasia? You don't know this hatchling.... do you?" she asked curiously. Fantasia stared for a moment, before she shook her head, Arethmic coming back to his senses underneath her. "No.... my queen." the royal guard said slowly, her eyes slowly taking on her normal, emotionless expression once more. Virgo shrugged, and turned back to the hatchling, trying to answer her question. "Um, I'm an IceWing, and those two big dragons back there are IceWings. And you're an IceWing, I think. And we're on a hill, near IceWing territory," Virgo grinned, feeling helpful. Aviur glowered up at the huge dragon, standing as tall as he could as he craned his neck to look up at him, stretching his wings to make himself look larger. He grinned slyly as the male's rage increased. To him, thid was hilarious, when a big, tough acting dragon became so angry. So dragons really do breath out smoke when they're angry. He was shocked at his words, he knew that. He snorted at the male's words and responded with the cheek of something otherworldly. "Commonor?" he spat. "I don't know who you think you are! You're just stuck up old drake with nothing better to do then boss dragons around and treat her like a hatchling! She's supposed to be ordering you around, not the other way round! You should learn some respect, so shut your ugly trap and obey her orders for once!" he knew those words would probably shock everyone around him. But he was a rogue, this was normal for him. As the dragon towered over him, Aviur prepared to fight. "You wanna go? I'll rain hellfire down on your sorry backside!" with no other words for him, Aviur spat at him and prepared to battle, unsheathing his claws with a loud, sword like 'shhiiing,' revealing the flaming claws hidden in the sockets of his paws. A whirl of colour and movement caused Aviur to jump back, as the once looming dragon fell flat on his face. His mouth as open as wide as it would go, so wide yiu could see into his throat, Aviur raised hid eyes from the face of his enemy to the face of the female dragon from before. Virgo thanked her, and Aviur caught his savior's name. Fantasia. Huh. "T-twenty tons?" he peered at Fantasia as if she were a goddess of war. "Remind me to never make you angry," he muttered, before looking at Virgo. He watched Fantasia as she noticed the hatchling, and his eyes narrowed when hers widened. He had an inkling she knew this hatchling.. He opened his mouth to question her, but Virgo beat him to it. Eyeing Fantasia with awe and respectful fear, Aviur looked at Virgo, and then it clicked. He wasn't too bothered, just shocked. She didn't tell him? Or introduce herself as the icewing queen? Huh. That proved to him she wasn't like Arethmis or whatever his name was. Smiling, Aviur looked at the hatchling. "And I'm what is called a FireWing," he added to Virgo's statement, smiling at the hatchling. Solstice watched the dragoness and drake speak. Her guards seemed to have been angered by something Aviur had said. One of the guards, the green-ish one, was thrown to the ground. 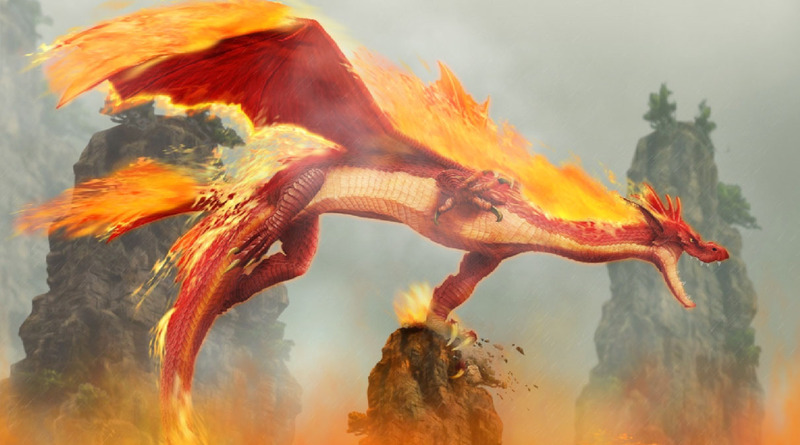 Her eyes widened as she watched this happen, while the fire drake was still getting in his face. She gasped in shock, though she was rather entertained by this comical show of violence. The dragoness guard stared at Solstice, and it caught her attention. It seemed like she knew her. The term IceWing sounded familiar, like home.... but at the same time, it brought the previous cloud of haze to her mind. "What is IceWing territory? Can we go?" she asked eagerly. She was excitewd to learn of this new thing, especially if a cool canine thing was apart of it. She seemed important, and that was what Solstice's little hatchling mind latched on to. Virgo smiled proudly when Aviur was left without words at the way a dragon half Arethmic's size took him down. See? It really wasn't the size that mattered. Fantasia would get up, shaking her scales, while also watching the tiny dragoness curiously. The hatchling looked strikingly familiar to her, but she couldn't place a claw on why. Meanwhile, Virgo was nonchalantly chatting to the FireWing and the tiny hatchling. And Arethmic was both embarrassed and frustrated. Once Fantasia removed herself off of him, he would slowly get up, growling a bit in agitation, as she did so. He would watch the two talk, very deathly quiet. Then he would glance over at Fantasia. His anger was quite mellow, but she still saw it burning in his eyes. "You know you didn't have to hit me that hard." A small smile from Fantasia. "I know." was her only reply. This caused Arethmic to roll his eyes at her, and turn back towards the dragon, not interested in continuing to casually chat with the same dragon who could probably take on five adult, seventy foot tall IceWings, and still kick their ***** all the way to the SeaWing territory. Virgo tilted her head at the small hatchling, "We could totally take you there! But first, do you have a name? Do you know who your parents are?" Aviur glanced at Virgo as the hatchling spoke again, awaiting a response. As he lashed his tail, he was thinking about the IceWing territory. He was unsure of his ability to withstand the cold if they ended up going. Not that he WANTED to go.. well, he kinda did.. mostly because of Virgo. What? What could he say? He liked her. While he awaited a response, he heard the male dragon complaining. He looked over his crimson shoulder and gave him the most innocent smile, before looking back at the hatchling as Virgo spoke again, his tail twitching as she asked the hatchling her name and where her parents were. Looking at the hatchling, Aviur opened his mouth, then closed it. He glanced at Virgo again, trying to make it low key, then he glanced at Fantasia with respect and slight fear in his eyes. When his gaze shifted to Arethmic, there was a tiny smile on his face, one of cheek and slyness. Being street-wise was fun, it meant you got to see your least favourite dragons get their tails kicked, either by you or allies. Looking at the hatchling again, Aviur spoke. "Have any idea who she is?" he asked Virgo, not taking his eyes off the hatchling, keeping his tone hushed. In an effort for her to hear him, he leaned a tiny bit over to her, but kept a respectful distance between them. "I mean, she couldn't be lost, since she would have said she was looking for her mom or something. If you ask me, I think her parents abandoned her, or.. well, or worse," his eyes had darkened slightly as he said this, keeping his tone lowered so he wouldn't frighten the hatchling with his words. The good sided part of him hoped they'd take her in. The bad side of him didn't say much, since Aviur wasn't an evil dragon. He was a good kid, it just took a bit to get under his skin and for him to open up to you. Leaning away again, Aviur awaited a response, eyes fixed on the hatchling. Solstice looked at Virgo and her guards. They seemed to argue.. constantly. And then Virgo asked her a question, which brought even more confusion to her tiny mind than there already was. "I don't know. I just.. kind of woke up just now. I don't remember.. anything. But my name's Solstice, I think." She explained firmly, looking very dopey. Solstice shrugged and stared at the collection of very different dragons. "Solstice Equinox. It's like, the only thing I got when I woke up. Is that gonna help?" Sagitarius ran out of home wanting to go see Virgo he wanted to talk so much to his sister he couldnt even congratulate her when she became the queen he felt embarrassed very embarrassed he wanted to go see Virgo faster and apologise for that but he also was scared that Virgo would be mad at him. That was the name of Virgo's grandmother. She had heard her mother Wolf talk about her before, but on rare occasions. The only think Virgo really knew about her grandmother was that she had been the original IceWing semi goddess, and one day had disappeared. After all, Solstice had disappeared around the same time that Virgo had hatched, so she had never been given the opportunity to see the face of her grandmother, and even if she had, she doubted she'd remember it. She tilted her head, curiously. "Did you say your name is Solstice Equinox? That's so strange! I mean, you have a very pretty name, but my grandma has the same name as you. Isn't that cool? She was a very powerful dragoness." but as Virgo spoke, behind her, tension would suddenly build up in both Arethmic and Fantasia. Virgo wasn't sure why, and Fantasia didn't wait very long to tell her. "This hatchling.... I remember what your grandmother looked like, Virgo. She was a beautiful, feathered ice dragon, with a splash of blue and white scales. I didn't see her much, but as the semi, all knew what she looked like." Fantasia would begin to grow quiet once more. Virgo blinked, unsure of where Fantasia was going with this. She didn't often hear Fantasia talk this much. It was a rare delight. But still.... disconcerting. Turning to face her, Virgo would ask, "Where are you going with this, Fantasia?" she was quite curious. In response, Fantasia would dip her head politely. "If I may, your majesty, I would like to speak to you in private. Away from the hatchling. The FireWing may come, too," she said, whispering the part about the hatchling so that they wouldn't hear it. Now Virgo was very curious. She glanced over at Aviur, a slightly worried expression on her face, and glanced back at the hatchling. "I'll be right back, little one. Wait here," and then she followed quickly in pursuit of Fantasia, who walked off a couple meters. Once they were out of earshot of the hatchling, Fantasia would whisper. "That hatchling. She looks exactly like Solstice." This caught Virgo off guard. "Wow. So she has the same name, and they look exactly the same? Is this just a coincidence, or what?" Fantasia shook her head. "I don't know, my queen. All I know is that we have a hatchling, who doesn't remember anything about her past, and has the same name and appearance as the missing healer." when she said it like that, it did become quite suspicious. But how was that possible? Adult dragons didn't just.... transform like that. Wait, Solstice? Aviur's head raised slightly. He'd heard that name before! Where had he heard it though? He blinked rapidly, and opened his mouth to state his thoughts, but then Virgo spoke up. Then Aviur remembered. Solstice.. he never met her, but he grew up hearing about her. "Woah, woah, woah! Solstice was your grandmother?!" he exclaimed. He peered at Virgo with shock and new respect, gaping like a dying fish. Then, Fantasia spoke and he turned his head to peer at her, tail lashing from side to side in his agitation. Virgo and her spoke to each other, and the young firewing's bright eyes widened at Fantasia's words. "U-Uh, sure," he stammered, before exchanging similar expressions with Virgo. Hesitantly, he stepped away from the hatchling, shooting a neutral glance at Arethmic, before following the two a few metres away. Stopping beside Virgo, Aviur listened to the two, eyes widening with each passing second. "Wait, Solstice is the one that went missing, wasn't she?" he asked, keeping his voice lowered. Glancing behind himself at the hatchling, Aviur blinked as he looked her over. She fit the description, it seemed. Looking back at Fantasia, Aviur's brow creased. For a moment, the young male was unsure of what to say, then, he remembered Atrex. "I don't know what's going on," he said as the image of the golden, four winged dragon popped into his head. "But I know someone who might." Solstice looked innocently at the tan doggish dragoness, stomping a paw and gasping in excitement. She had the same name as some old cool lady! The grandma of another cool lady! She was a cool lady now! "That's so cool!" The hatchling yelled, though her face quickly fell as the female guard seemed concerned. She described this so called other Solstice, nervously glancing at the antsy little hatchling. The adults all quickly communed elsewhere, murmuring quietly about something that clearly didn't concern her. Solstice plopped down on her rear, straining her ears in hope that she could catch at least one word of whatever the heck those silly dragons were whispering about. Glancing over her shoulder, Virgo looked from Solstice, to Fantasia, to Aviur, than back to Solstice, before finally settling on Aviur again. "Really? I don't know if anyone could know what was going on. Maybe it's just a coincidence?" Virgo would say, a goofy smile forming on her face, as she stared up at the other dragons with a slightly guilty expression. Well, more like one of embarrassment, quickly regretting her words, and looking away. Fantasia didn't really notice this, though, and continued. Turning to Aviur, she asked, "If you have any knowledge that could lead us to this hatchling's origin, then please, share with us." she would say, her face so emotionless, yet her voice oddly not monotonous, it sounded like she was giving Aviur a command, rather than a request, but her choice of words would say otherwise. Perhaps that was why she had chosen them. Then again, Fantasia had never been one with words. She had always been one to act first, then ask questions later. Virgo was conflicted. She didn't know what to do. She was quiet confused. Her tail swished, an exasperated expression on her face. While yes, this situation was quite an odd predicament, she knew one thing. They needed to help this hatchling, regardless of whose it was. Whoever it belonged to, and whatever or whoever it was, they needed to take care of it, because the parent sure wasn't. After all, the young hatchling couldn't even tell who its parents were, or even if it had any. And they really had no other information about it other than Aviur's mystery dragon. So their only bet was to hope Aviur knew what he was talking about, and that this dragon really did have information about this case. Meanwhile, while the dragons were debating on what to do, Arethmic was catching on to the fact he was being ignored, and he growled a bit, shaking his head. He had caught a bit of the conversation about this dragon's name, and such, so he wasn't completely lost, but still. He couldn't shake the fact he was being... ignored. So, while the others were discussing stuff, Arethmic decided to go over and sit down beside Solstice. "Hey there, little Solstice. My name's Arethmic, how are you?" he said, a small smile appearing on his face. Arethmic had never been all that good with children, but he supposed he could keep this child company while the others were talking. After all, he was quite aware that kids did not like being ignored. Aviur looked at Virgo at her words and shrugged. "To be honest, V, it's probably anything but a coincidence," he responded, before looking at the female dragon in front of him. He was currently debating lots of things. Should he help? Should he even ask Atrex? Aviur blinked at Fantasia's tone, but nodded and spoke. "His name's Atrex. He's one of them dragons that just reads all day. He might know something. It's not the best kind of lead, but we have an option. I think he might know something though. He's smarter then he lets on." Glancing over his shoulder, Aviur saw Arethmic hanging out with the hatchling, or trying to. Looking at the two dragons in front of and beside him again, Aviur awaited their answers, lowering his gaze slightly out of both respect for Fantasia and shyness. he had never been one to state his opinion like that before. Usually, his opinions contained a lot of shouting and swearing.